You can reveal this card in your hand; your opponent randomly chooses 1 card from your entire hand, then you discard the chosen card. Then, if the discarded card was not “Danger! Thunderbird!”, Special Summon 1 “Danger! Thunderbird!” from your hand, and if you do, draw 1 card. If this card is discarded: You can target 1 Set card your opponent controls; destroy it. You can only use this effect of “Danger! Thunderbird!” once per turn. Happy Friday! Danger! Thunderbird! is a Level 8 Dark Winged Beast-type monster with 2800 Atk and 2400 Def. Those stats are great and putting another Level 8 monster in Danger! for Trade-In was a great idea. Usual Danger! 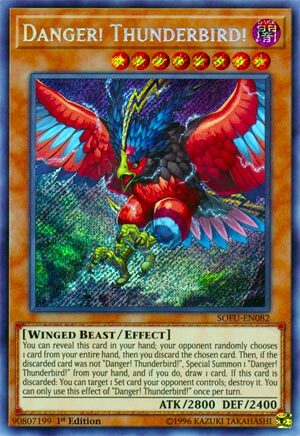 effect plus the ability to destroy any kind of opponent’s set card when Thunderbird! is discarded make for a nice one-two punch with Bigfoot. It is a hard once per turn, but you should only be running 2 of Thunderbird! not because there is anything wrong with it, but because set cards are less common. Have fun with this deck while all the Darkworld support is there. Score: 4/5 Art: 3.5/5 No lightning or thunder, but the bird looks cool. We end this week off with the second biggest Danger! monster there is now, Danger! Thunderbird! Thunderbird! is a Level 8 DARK Winged-Beast with 2800 ATK and 2400 DEF. Probably the first Danger! monster with impressive ATK and DEF. Winged-Beast is solid (oddly not a Thunder in a set that gave us a ton of good Thunder monsters) and DARK is obvious at this point. Level 8 gives you Trade-In to discard this, which Danger! monsters love. Thunderbird! has the Danger! effect all the other monsters have, and when Thunderbird! is discarded you can destroy a Set card your opponent controls and this is a hard once per turn effect. Having access to destroying Set cards is something Danger! lacked before, so it is nice to finally have it, you never know what your opponent has set, so this can let you force a set card out or just straight up get rid of it. Thunderbird! is nice for Danger! to have and is worth considering, but probably 1 less than Danger! Bigfoot! if you don’t have the room for playsets since face-up cards are more common. Maybe 3 Bigfoot! and 2-3 Thunderbird! if you have the room, but feel free to lower them in favor of other cards. Closing my Danger! week is Danger! Thunderbird! as we’ve approached the strongest new release for the theme. Thunderbird! is Level 8, Dark, and a Winged-Beast, who has a wonderful 2800 attack (and a solid 2400 defense as well). Once again, skipping past the standard ‘Danger!’ text, we see that if Thunderbird! is discarded, you have the option of Targeting a Set card your opponent controls, and destroying it. There are players that won’t be a good thing against, say Abyss Actor players, as we covered a handful of those cards last month. But you do have the versatility of the card simply being ‘Set’ so it can be a Monster, or a Magic/Trap card, which is a nice bonus for you. Obviously this card combos well with Bigfoot! as it can destroy face-up cards, so there’s that as well. Powerful, destructive, does well for standard what the theme does, not much else to say here. (We didn’t cover Second Expedition Into Danger! this week, but I felt Danger! Response Team was a better card). Art: 4/5 The color in here is nice, but this bird doesn’t scare me like some of the other Danger! art does. I also feel like being named Thunderbird, there should be some…Thunder in the picture. But it looks more like a tornado or something may be about to happen.